There is an old joke that runs, 'Everyone hates a lawyer until they need one.' The reason that lawyers and courts are both so unpopular and so necessary is not hard to find. The law has developed organically over 800 or so years and comes complete with its own jargon and labyrinthine processes, making it relatively inaccessible to most. At the same time, however, the courts are supposed to be the final arbiters of the rights of citizens. The traditional idea of Westminster constitutionalism goes back to the Enlightenment and is largely reflected in Australia’s Constitution. It is that people’s interests are protected by a delicate balance between the three arms of government. The law-making body (Parliament, in Australia) is answerable to the people which elect it. It is constrained by the Constitution as well as by free and fair elections. The executive, which carries the laws out, has the most power but is answerable to both Parliament and the Courts. The Courts, finally, determine whether the laws are applicable in any given case. As the guardians of individual rights, the Courts are therefore a vital part of a functioning democracy (even though they are the weakest of the three branches). This week we saw a number of developments which indicated that, in Australia at least, these constitutional ideas appear to be fading. In the first case, we have had Parliament rush to gag the High Court as it was about to question whether or not the offshore detention of asylum seekers was legal. Here, the idea that the Court decides the rights of those before it and whether or not the law is applicable in any given case would be subverted by the Government, not only giving itself extra powers to detain asylum seekers overseas, but also making them retrospective to effectively remove rights currently held by the asylum seekers suing the Government. The Opposition, effectively the Parliamentary watchdog, has agreed to roll over and have its tummy tickled in the name of being cooperative. This is despite the fact that the UN, Immigration and Border Protection’s own internal reviews and an on-going Senate enquiry into the offshore camps continue to reveal abuses, facilitated by the fact that there is no real accountability as to their operation. In recent days, Mr Abbott announced (in a lecture commemorating 800 years of Magna Carta, no less) that a modern day sentence of banishment was necessary to protect the rule of law and prevent the risk of acquitted terrorists from causing harm in Australia. No freeman shall be arrested or imprisoned or disseised or outlawed or exiled or in any other way harmed. Nor will we [the king] proceed against him, or send others to do so, except according to the lawful sentence of his peers and according to the Common Law. In the same vein, Steve Ciobo MP described Zaky Mallah’s terrorism acquittal as based on a 'technicality'. This technicality arose from the fact that a jury had acquitted Mr Mallah and that subsequent anti-terror laws were 'not retrospective'. Again, retrospective laws mean, by definition, that the acts committed were not a crime at the time – as demonstrated by the acquittal. The truly frightening thing about retrospective laws is precisely that they make conduct which is perfectly legal when it is done, criminal by fiat. Anyone can be convicted of anything retrospectively. This is precisely why many countries’ criminal codes and constitutions forbid retrospective criminal legislation. It is interesting that the main fallout from the Q&A program appears to have been a complaint from the Government, followed by an apology from ABC, for allowing Mr Mallah to speak at all. The freedom of speech by which people are 'allowed to be bigots', apparently does not extend to defending one’s innocence. Everyone may hate lawyers most of the time – but I suspect that at least some people will miss them when they are gone. Justin Glyn SJ is a student for the priesthood who previously practised law in South Africa and New Zealand. His PhD is in administrative and international law. 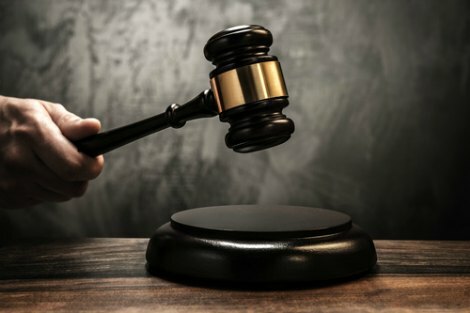 Judge's hammer image by Shutterstock. The prosecution contends that my alleged conduct on a certain past date, which was legal under the laws made on or before that date, can be made illegal with effect on that date, by a law passed after that date. If this contention of law is correct, then my alleged conduct on that date can be made legal again, with effect on that date, by a law passed after today. Obviously this court has no way of knowing whether such a law will be passed. Consequently, according to the prosecution's contention of law, this court has no way of knowing whether my alleged conduct was legal or illegal, and therefore has no way of finding me guilty of any offence in respect of that conduct, whether I engaged in that conduct or not. Well said Justin. Some of us will recall the cry that went up from the conservatives when it was proposed that legislation against bottom of the harbour schemes be retrospective. Recent acts of the government, supported by the lily-livered opposition, show that neither respect the rule of law. The most important reason why this nation needs a 'bill of rights' provisions in our constitution is to protect us from the group that can do us most harm, that is, the government of the day. Every day it is becoming that little bit more frightening to live in this country. And it's not the terrorists who frighten me as much as our own government, and the people who mindlessly support anything and everything it does, especially if there is a whiff of bigotry to it. We are about to start unwinding trial by jury, presumption of innocence and Magna Carta - almost to the day of its 800th anniversary. And we're clamouring for it. Do you remember back to just after 9/11, when Bush said that the terrorists hate our freedoms and that we could not let them win. Well, is there any doubt, ANY doubt, that they are winning? When, people of Australia, are we going to wake up? Magna Carta is the foundation of our democratic freedoms: “No freeman shall be arrested or imprisoned…except according to the lawful sentence of his peers and according to the Common Law.” However in 1940, Sir Oswald and Lady Diana Mosley were jailed without charge or trial largely on the orders of the Home Secretary of Britain. After three years they were released only to be held in home detention until the end of the war. This was not an omen for the end of democracy or the Rule of Law. The Mosleys were Nazi sympathizers and the government deemed it wise to incarcerate them during a crisis. Virtually no one objected. Today, only a fool or a knave would fail to recognize the crisis caused by worldwide Islamic terrorism which justifies stern government action. Yet the prevailing attitude of the Left seems to be the Alinsky rule, “make the enemy live up to its own book of rules”—an impossibility in a time of crisis—and their strategy casts the government as the enemy. Despite suspending Mosley’s rights, Churchill won the war and democracy survived. Today’s Leftist strategy will ensure the opposite. Dear Ross Thank you for putting the question in perspective. Your mention of World War II is thought-provoking and raises what for me is a critical question. Is it true that terrorism is of the same order as the six year war against the Nazi Reich which killed millions? If it is, and the suspension of rights is justified, then exactly where do we set the bar? Must we suspend civil rights to deal with car crashes? Domestic violence? Falls in the bath? All of these are serious causes of death and kill more people in the West than terrorism. If not, why not? If so, what kind of law do we believe in? For myself, I would agree with Lord Hoffmann (hardly a fool or a knave) who stated in his judgement in A v Sec'y of State, "the real threat to the life of the nation ... comes not from terrorism but from laws such as these."